Roughly two weeks ago, Jeremy Lin was sleeping on his brother’s couch and was unsure if he would see any playing time behind Toney Douglas and Iman Shumpert. Now, retailers are eagerly awaiting shipments of Lin merchandise to sell to Knicks fans seeking No. 17 jerseys, while Lin himself has a six-figure guaranteed contract. A product of Harvard, Lin’s name has been linked this week with former Crimson greats like Joe Carrabino (a forward who still ranks as the school’s career leading scorer), Keith Webster, and a fellow by the name of Edward "Ed" Smith. His name might not be familiar, but Smith — a forward who graduated in 1951 — still holds the distinction of being the last Harvard player selected in the first round of the NBA draft. The six-foot-six forward was part of an athletic family: His brother, Gene, played in the White Sox organization, and both Ed and Gene were wonders on the court and diamond for Grandview Heights High School in Ohio in the late 1940s. According to his younger brother, Terry, the archivist emeritus at the Grandview Heights/Marble Cliff Historical Society, Ed was always tall — in fact, he grew an additional inch during his Harvard playing days. By the time he was a high school senior, Ed was all-CBL (Central Buckeye League) and had tied the league hoops record for most points in a single game. It’s unclear how Ed ended up at Cambridge; Floyd Stahl, who was then Ohio State’s baseball coach (but had formerly served as Harvard’s basketball and baseball coach), may have convinced Ed to make the eastward trek. While at Harvard, Ed was one of the better players in the conference. At one point, recalls Terry, there was a giant mural of his brother on the Harvard gym’s wall. His senior year, Ed finished second in the league in scoring, and it was not unusual for the forward to score 10 or more points a game. Unfortunately, the Smith family rarely got to watch their son in action: The one time Harvard ventured into the Midwest, during his junior season, Ed was suffering from an injured leg and didn’t play. To complicate things further, the Smiths did not own a television, so when Ed did appear on TV (as part of a East-West College All-Star showcase), the family had to watch the game at a cousin’s house. “But the sound went out and was replaced by ‘Blue Danube’,” remembers Terry. 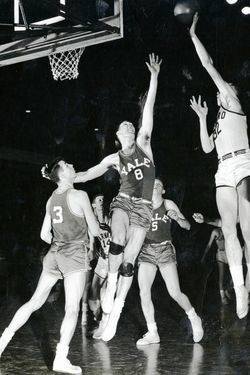 Ed expected he would have a professional career and was not surprised to be chosen by the Knicks with the sixth overall pick in the 1951 draft. (The team also selected future legendary college coach Al McGuire in the same draft.) However, Ed’s professional debut was delayed for two years, as he was drafted and had to serve in the Army. When he returned for the 1953-54 season, he did not make much of an impact on the court: Ed fractured his left hand in the first game of the year in November 1953, and was sent back to Ohio to rehab. After a stint with the Washington Generals, Ed returned to the the Knicks later in the 1953-54 season and played in ten more games. For the year, he'd average just over two points per game, though he'd chip in five points against the Boston Celtics on February 14, 1954. Ed was invited back to the Knicks’ training camp the following season, but was cut, never again donning an NBA uniform.